For those born in the month of June, lucky you! Your birthstone is the rare, yet beautiful pearl. “Who comes with summer to this earth And owes to June her hour of birth A pearl should wear against her skin Who’s innocence many a heart shall win.” Unlike the other 11 birthstones, pearls are unique in that they are not minerals mined from the ground but beautiful, natural objects that grow organically within living, shelled molluscs. There are two main types of Pearls: Freshwater and Saltwater pearls. Both of these can be either found as wild pearls, found growing naturally or cultured pearls, which occur through human intervention. The Latin translation for the word ‘pearl’ literally means ‘unique’ which attests to the fact that no two pearls are the same. Traditionally, pearls are found in their natural milky white colour, although it is not uncommon to find wild pearls occurring in silver, white, blue or black. 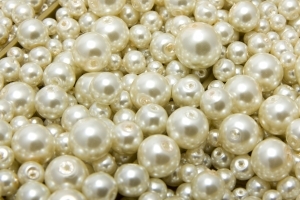 Wild pearls are extremely rare, making them typically high in value, with large, perfectly round pearls the most costly. Cultured pearls can be dyed any colour from pink to yellow, however these are much more common and less likely to be sought after. Pearls are found or cultured throughout the world, usually in lakes, rivers or oceans such as the South Pacific, the Persian Gulf, the Gulf of Mexico, or countries including Europe, Japan and Australia. The earliest known record of pearl jewellery was discovered with a Persian Princess, who died in 520 BC. Ancients valued pearls for their magical powers and as symbols of the moon, however since then they have been strongly favoured in jewellery, the most popular being pearl necklaces. Other types of pearl jewellery available include bracelets, rings and earrings, which can all help you benefit from their healing properties. The June Birthstone Pearl is known as ‘the stone of sincerity’, representing modesty, chastity and purity, which often makes them popular wedding gifts. They bring centring and calming reflection, allowing the wearer to balance their emotions. It is believed that pearls help you to connect with the ultimate feminine energy, however beware as pearls can also absorb negative energy so cleanse often to allow them to recharge. Physically, they support the solar plexus chakra, and are reputed to be effective in healing health problems relating to the spleen, stomach and intestines. Pearl birthstone jewellery counts celebrities such as Marilyn Monroe and Angelina Jolie amongst its wearers! If you or someone you love was born under the pearl this June, Psychic Light would like to wish you a very Happy Birthday.